Delaware is set to join 13 other states and the District of Columbia in joining the National Popular Vote Interstate Compact that will award Delaware’s and all other compact member states’ electoral votes to the popular vote winner, that is once Governor John Carney (D) signs the bill, as he has said he will. He will apparently sign the bill this coming Thursday at 1:15 pm. Once the Governor does sign the bill, it will not go into affect right away. Instead, the Interstate Compact will only become active when the number of electoral votes of compact member states reaches 270. That way, the winner of the popular vote is guaranteed to win at least 270 electoral college votes. Right now, with Delaware, Colorado and New Mexico joining the compact in recent weeks, the Compact’s Electoral Vote total is 185. In the map above, those are the states in the darker blue. 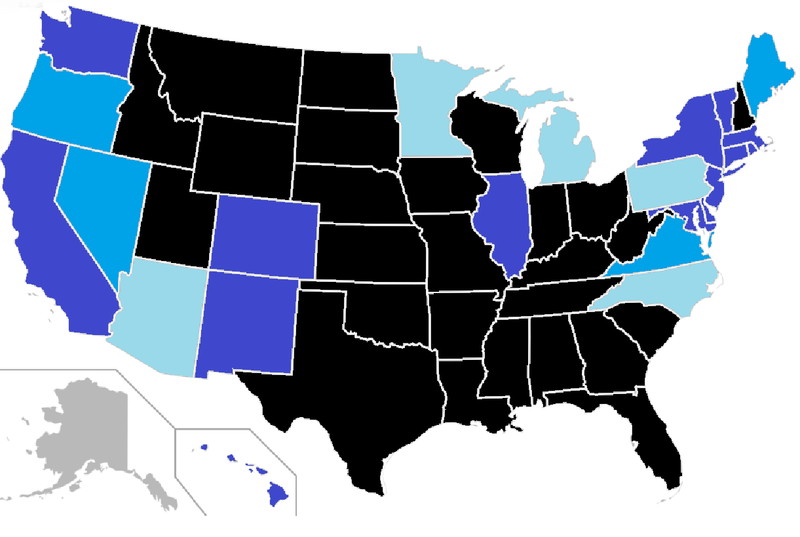 In the medium blue color are states, such as Nevada, Oregon, Virginia and Maine, that can pass the law by 2020, given the Democratic control of the legislature and governorships in those states. That would bring the Compact total up to 215 electoral votes. Depending on how the 2020 and 2022 elections go, the states colored in light blue, namely Pennsylvania, North Carolina, Michigan, Minnesota and Arizona, could put the Compact over the top with 287 Electoral Votes. Anyway, I neglected to provide a vote count when the bill passed last week, so check it out below. In the Senate, two Republicans from Northern New Castle County, Cloutier and Delcollo, joined the Dems in passing the bill, perhaps knowing that their reelections in 2020 depend on agreeing to as much Democratic legislation as possible And yes, I know, this was a nonpartisan bill that had Republican officials testifying in favor of the bill on the floor, but the Republican partisan stance is to oppose this bill. This bill had many more Republican sponsors, like Jeff Spiegelman, but he and they had to drop off the bill due to the blowback they were getting from the Republican base. Spiegelman is like Delaware’s Lindsay Graham. Betraying principle to escape the rage of the insane GOP base. In the House, two Democrats crossed the aisle and voted no: Bill Carson and Bill Bush. I would love to know their thinking. Really hope this succeeds, the Electoral College must fall, and as we’ll never get a constitutional amendment this is the next best thing. I have always maintained that if the American people knew what the college was and what it did they would want it gone. Red state politicians excepted. Bill Carson and Bill Bush listened to their constituents on this.